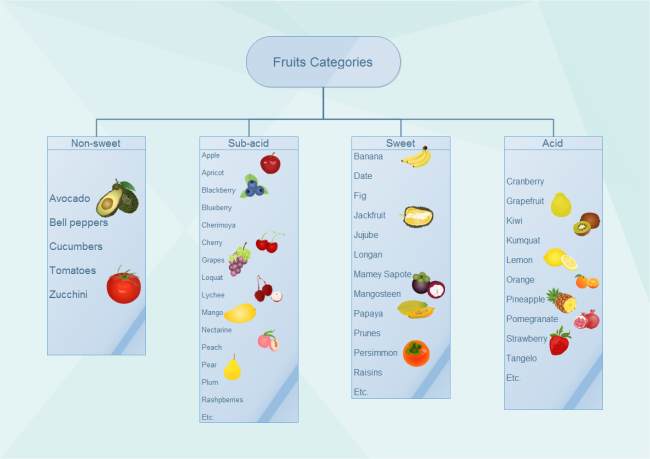 Description: A free customizable fruits tree diagram template is provided to download and print. Learn some knowledge of fruit categorization is beneficial for health. For example, the acid fruits should not be eaten combined with sweet fruits. Let this tree diagram help you. Quickly get a head-start when creating your own fruits tree diagram. Here is a simple fruits tree diagram example created by Edraw Max, which is available in different formats.